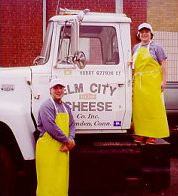 Elm City Cheese was founded by Polish immigrants in 1896 in New Haven, Connecticut. Originally, Elm City Cheese was a dairy and sold many different products, including various types of cheeses. Over the years, Elm City gradually narrowed their product line. Instead of selling a large variety of dairy products, they concentrated on producing various types of cheeses. Today, we exclusively manufacture grated cheese. By focusing on a narrow product segment, we can produce a relatively large amount of a quality product. The business has been passed down through several generations of the family, surviving the Depression and two world wars. Today, Elm City is still making cheese in nearby Hamden, CT.
We manufacture grated cheeses and sell to wholesale clients throughout the US.